American Apparel is going Canadian. The embattled clothing company is closing all of its retail stores and Los Angeles headquarters after its purchase last week by Montreal-based company Gildan Activewear, The Los Angeles Times reported. All 110 American Apparel stores will close by the end of April, with as many as 3,400 employees expected to lose their jobs. The sale follows the once popular retailer ― whose logo was “Made in America – Sweatshop Free” ― filing for bankruptcy in 2015 and again last November. Gildan, whose brands include GoldToe socks and Anvil, has factories in Central America, the Caribbean, Bangladesh and the U.S., according to the company’s website. Currently, the only finished goods produced in the U.S. are socks, the Times reported. Though the American Apparel brand will reportedly live on, it’s expected to be far different than it is today. Analysts speaking to The Times forecast that the company likely will not keep its manufacturing operations in California, especially with the state planning to raise the minimum wage. Because Gildan’s clothing is sold through other retailers, the Times suggested that any future American Apparel items will be found in chain stores, like Kmart or Target, or through other wholesale buyers. The company’s sale comes two years after its controversial Canadian-born founder, Dov Charney, was ousted in 2014 following allegations of sexual misconduct and misuse of company funds. MARIO ANZUONI / REUTERS American Apparel’s retail stores and its Los Angeles headquarters, pictured, will close following its sale. American Apparel will be closing all 110 of its retail stores, as well as its Los Angeles headquarters. The popular retailer, known for colorful cotton basics and its “Made in America – Sweatshop Free” logo, was acquired by Gildan Activewear on Jan. 10 for $88 million. At its peak in 2007, the bankrupt retailer was valued at $1 billion. 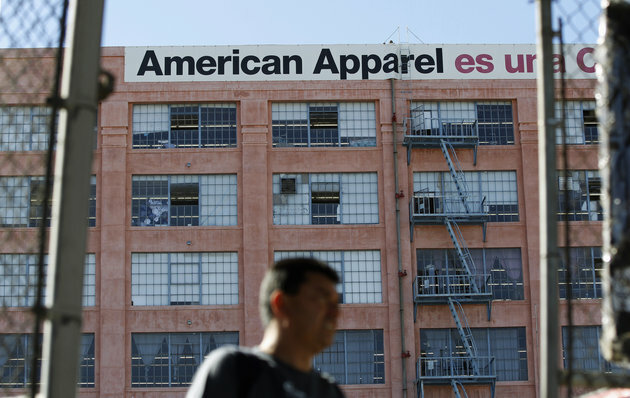 Gildan, a Canadian t-shirt and underwear maker, will reportedly close all American Apparel stores by the end of April. As many as 3,400 employees could lose their jobs. American Apparel was founded in 1989 and known as much for its edgy marketing campaigns, often featuring edgy models in minimal clothing, as its controversial founder, Dov Charney. Charney was outspoken about his support for worker rights and immigration reform, views which clashed with reports that he had sexually harassed and assaulted employees. In 2014, the board ousted Charney as chairman and CEO, citing the sexual harassment allegations and misuse of company funds. Following the Charney incident, the brand name took a serious hit, which led to a revolving door of higher ups and culminated in the brand filing for bankruptcy in 2015. Throughout this time, Charney was fighting his ousting in the courts. Currently, he is working on a clothing startup. The brand ultimately failed to close enough stores and adapt to the demands of the fast-fashion industry, with teens turning to cheaper retailers, like H&M and Forever 21. American Apparel filed for bankruptcy again last November. Gildan will likely not produce any American Apparel products in California, but could manufacture items in cheaper states. As the stores close, the company’s goods will likely get picked up by wholesale buyers. These items will still carry American Apparel tags, but at a lower cost. Gildan sells clothing through other retailers, such as Target and K-Mart, and the fate of the American Apparel brand will likely follow a similar path. American Apparel just got a lot less American. The once popular retail chain famous for its racy ads was bought at auction for $88 million by Canada’s Gildan Activewear, which intends to close American Apparel's Los Angeles manufacturing facilities as well as its remaining 110 U.S. stores, the Los Angeles Times reported. More than 3,400 employees could be out of work within a few days. Gildan will likely move most — if not all — of its production overseas, especially with California’s minimum wage set to reach $15 an hour in 2021, according to the newspaper. At the peak of its 20-year history, American Apparel had about 230 stores and was valued at nearly $1 billion. The clothing store in 2014, however, voted to oust Charney as chief executive and chairman after allegations of sexual misconduct with employees, and then filed for bankruptcy a year later. Most of Gildan’s products include basic clothing pieces like T-shirts, so it saw an opportunity to add a “premium fashion” brand that will complement its current business model, Gildan spokesman Gary Bell told the Times. 0 Response to "American Apparel Stores To Close After Canadian Purchase"